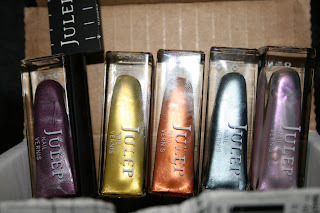 Plumpish Beauty: May Julep Maven & An Award! First of all, I would just like to say thank you to Sabina of Beauty Blogs & More for the "One Lovely Blog Award." I appreciate her so much as a subscriber to my blog. She never fails to leave lovely comments and has such a wonderful blog herself! Go check out her blogs and don't forget to check out the one she has about making candles!! It has me wanting to do some now! :) Thank you so much, Sabina!!! As usual, I'm a day late and a dollar short with my beauty boxes! The following are the colours for May. I switched from Classic with a Twist to It Girl. The first one; Kylie is a magnetic polish. I swatched it and it works and looks amazing!! :) I have been waiting for my nails to grow out to use it! The yellow is Nessa and the Orange is Ashley. The other two colours I received are add ons. The bluey one is Fina and the last one is Ellie. All of the colours aside from the magnetic are shimmers. I'm disappointed with the application of these, as it's quite streaky. I guess it has something to do with the fact that they're shimmers? Look how pretty all the colours look together! :) Isn't this simple happiness? This set of 3 was a special they had, I believe Shades of Grey. The 3 were 19.99. I don't know why I suckered myself in, especially since I already had Annette! GRR! 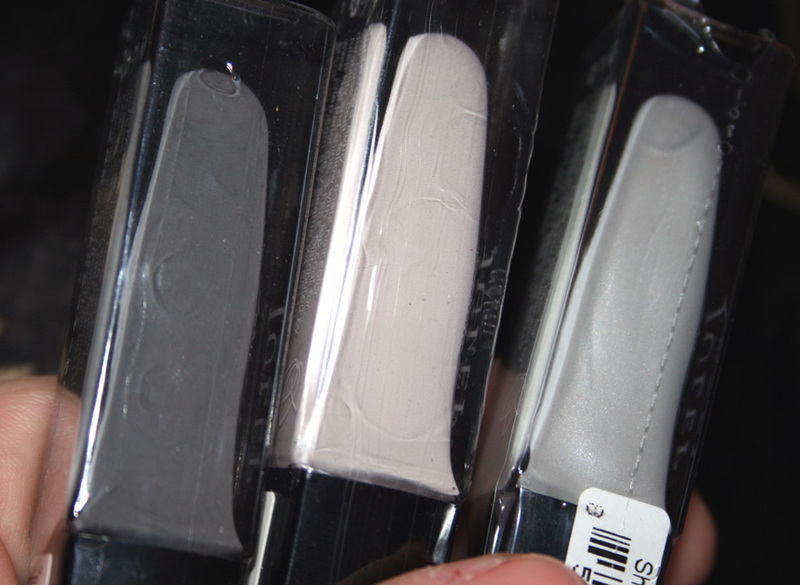 Anyways, The far left is Meryl which is a an asphalt (lighter than pictured) cream grey, the middle is Annette that looks more greige than dove grey to me and the last one is Shania which is a light grey shimmer. This one looks more like a white shimmer when I swatched it. Hope you all had a lovely weekend. I'm going to try and get caught on some posts... because all my stuff kind of sits out before I blog about it..and I'm running out of space! 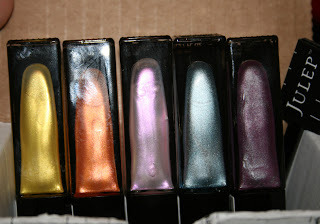 Coming up will be posts about Loose Button, Beauty Box 5, BH Cosmetics, Yves Rocher and Sweet Divalicious! Hopefully, everything will be out before my June boxes start to arrive..hehe! yes, I have been missing your posts lately! did you order a June mystery box? I did! 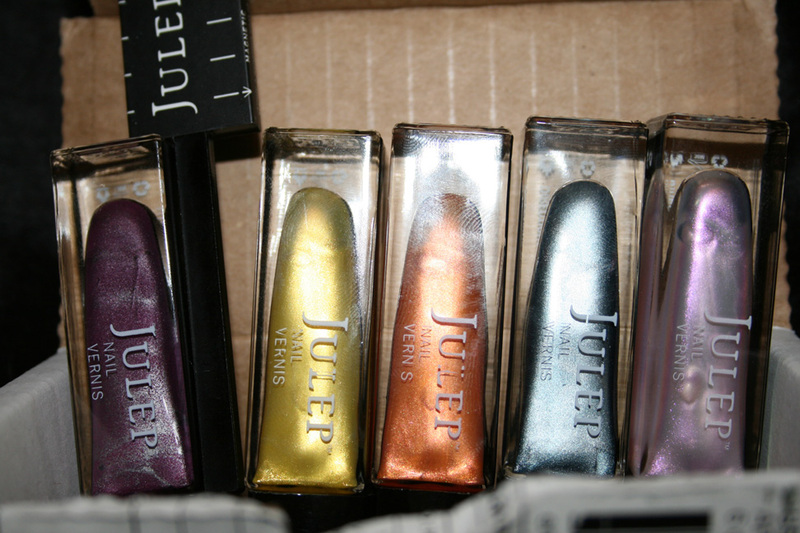 I still haven't got that polish you sent me in the mail, hrm. hope the postman didn't keep it for himself! lol! I just saw your comment on my blog! don't you dare ship out another one! I am sure it is on its way, it just seems to be taking a while! I don't want you to have to pay for a 2nd shipment though. How long ago was it sent? I hope it didn't get lost! A lot of people don't like grey polish, but I love it!! It's so classy/classic looking. Maybe that's just me haha. Looking forward to seeing some swatches of all your new colours!! I think so too! I love grey! I think I want to do that ombre effect now where each nail is slightly darker than the next!